It was a clear 22 degrees at Gobbler’s Knob this morning when Punxsutawney Phil, the weather forecasting groundhog, emerged from his cage and blinked with no signs of seeing his shadow. 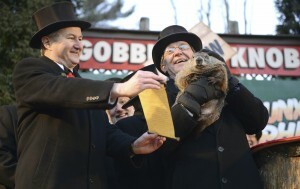 The Groundhog Club emcee proclaimed it a clear sign of an early spring. “Is this current warm weather more than a trend? Per chance this winter has come to an end? There is no shadow to be cast, an early Spring is my forecast!,” read Jeff Lundy, vice president of the Inner Circle of The Punxsutawney Groundhog Club, to a group of about 10,000 onlookers, according to the Associated Press. In New York, Staten Island Chuck agreed. It marked an uneventful morning for both groundhogs, which is a good thing, as far as both groundhogs and their handlers are concerned. There was the time Staten Island Chuck bit Mayor Michael Bloomberg’s left hand as the mayor tried to lure him out with an ear of corn, according to this story in Time. And the time Jimmy the Groundhog in Wisconsin bit Mayor Jonathan Freund’s ear. And the time in 2009 when New York City Mayor Bill de Blasio dropped Chuck’s replacement, Charlotte, who died a week later of internal injuries. This year, New York City Mayor Bill de Blasio was in Iowa stumping for Hillary Clinton and missed the Groundhog Day commemoration, AP reports.